Hey C J can you put me down for the Last Star Wars Helmet please, we are not going to be home going on vacation next week so when I get back will send you the money if that is ok with you? 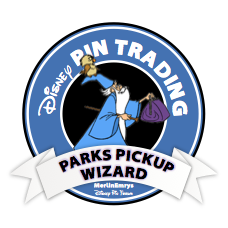 Hello, I was directed to you as you are said to be doing WDW pickups. I'm looking for the 2017 Sorcerer Mickey Hollywood Studios pressed penny-one of a series of four, one at each park. I don't know where the particular machine is located, other than it being only available at Hollywood Studios. Would yopu be at all willing to find this for me? Thanks so much! All I can tell you about it is that it is dated 2017 like the other 3, and it should have Sorcerer Mickey and an icon representing HS. No problem! Hope you got some good stuff from your mystery boxes! Did you get my recent PM? hi,did you receive my pm with my address for pin it forward please,i never heard from you sorry,thanks. Hey Hun. Did you ever get my email? I have a major love for Sword in the Stone ones, especially Merlin. I also love those "invade real life" pins like the Masterpiece collection or Pin-tiquities (Vitruvian Mouse, Minnie Mouse Mona Lisa, etc). I also love Prince John and Sir Hiss from Robin Hood, along with pretty much all aspects of Aladding, hahah! And one can never go wrong with some classic characters like Donald, Scrooge McDuck, Darkwing Duck, and Cogsworth (some random favorites). Aside from pins, I'm a university professor teaching writing and ancient world literature. I especially love Shakespeare and mythology, and of course King Arthur legend. I'm working on my Ph.D. in Victorian children's literature! I'm always happy to trade, so please give my Pinpics collection a look and we'll work something out! Have a great day! Always a great buying experience! March pickup - always great to work with, Many Thanks! The best pick up person.